I have had many surprises since becoming a mom. I found out that children under the age of six never walk down a hallway when they can run; that corn kernels pass through the body whole; and that boys have a testosterone-powered impulse to test the breaking point of everything, especially new toys, with predictable results. 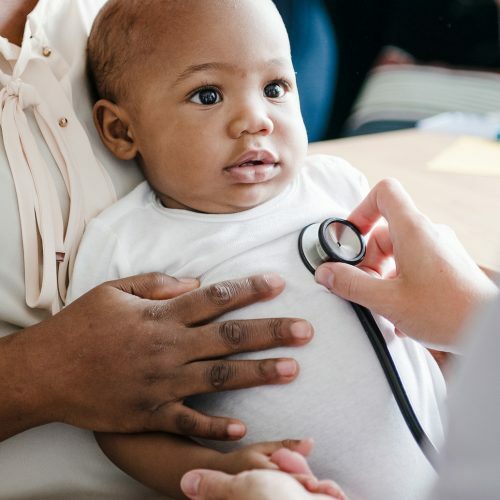 But the biggest surprise of all was the discovery that babies and toddlers can actually enjoy, and even look forward to getting a haircut, or visiting the doctor or dentist. (Certainly not the way I ever felt!) And all I had to do to make this possible was to help my baby ‘look forward’ to these routine events by honestly preparing her for the situations beforehand. 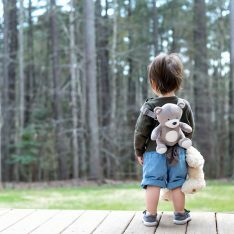 When I began attending RIE parenting classes as a new mom, I adopted the habit of telling my baby what was happening to her, and what was about to happen. I told her that I was going to pick her up, place her on a changing table, or do anything that involved her, before I did it. I learned that babies crave predictability. They like the teensy bit of control they feel when they can anticipate what will happen next. It makes their world feel a little less overwhelming and more secure to know, for example, that after bath time they will put on pajamas, hear a lovely song, and then be carried over to help draw the shades before being placed in their bed. Babies like to be included in a process, to participate as much as possible, even if it just means being informed about all that is happening to them. 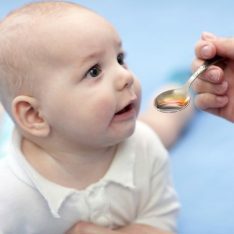 When babies are treated with this kind of respect, they are surprisingly cooperative, because they are aware and engaged. But when we scoop a baby up without a word, or distract her with a toy to get a diaper changed quickly, we discourage her involvement, and make her feel manipulated into compliance, rather than feeling like a partner in an intimate activity. Even though babies cannot speak, they are whole people, capable of participating actively in a relationship with us, and in their lives. The sooner we honestly take them in and invite them to join us, the sooner they will. When my daughter and I arrived at the doctor’s office she had been hearing all about, I could sense her eager anticipation, and when the doctor finally came into the examining room, she was quiet, attentive, breathlessly waiting for all her predictions to be fulfilled. Unfortunately, this well-meaning doctor launched into a comedy/magic routine, whizzing that little pen light all over like a firefly in his attempt to distract, telling her, “I see a birdie in your ear!”, and then sneaking in the peaks he needed for his examination. My baby was nonplussed. I moderated. I told her what the doctor was actually doing, so that she could stay involved and at least mentally participate as much as possible. He is a fine physician, but has a common view about children — that they cannot be trusted with the truth and need to be tricked and entertained to distraction for him to get his job done. Happily, my daughter enjoyed her first doctor’s office experience enough to want to go back. She reacted with similar interest to wearing a giant bib at the barbershop and feeling the snip-snip of scissors cutting her hair, and she always looked forward to the dentist, even though she had to keep her mouth open for a long, long time. No question my children appreciate a lollipop, a new toothbrush, or an “I have great teeth” sticker. 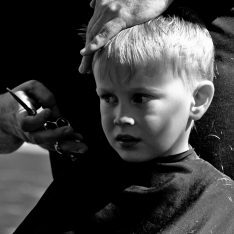 But I came to the conclusion a long time ago that the honest preparation that led to their active involvement in those early experiences with the doctor, dentist and hairstylist is the reason my children still like going. Or, maybe they’re just weird kids. I totally agree Janet. I always wanted my son to trust me and I knew that as soon as I lied to him that trust would be broken. I had my own tricks to help him through things, but I never told him “it wouldn’t” when I knew “it would.” It does pay off just as you say. My son learned not everything is pleasant in life, but that knowledge never disengaged him from it. Growing up ADHD it was important for him to know in advance what was coming, good, bad or indifferent. And knowing may it easier for him, never harder. His mind never had to imagine horrible excruciating things beyond his comprehension because he knew whatever it was, would be more or less what we told him. And that honesty both prepared him and got him through it. After all, a sting is only a sting, not the end of the world. Come to think of it, my kids’ doctor does the same thing — ‘there’s a carrot in your ear!’… ‘look at the birdie!’… It’s really kind of embarrassing, but I guess the doc’s got his routine, so…. This post is interesting to me because I completely agree and I have related to my daughter in this way ever since she was born. However it hasn’t worked! She seams fine, interested and eager about the experiences we talk about before hand (i.e. doctor visits, hair cut). We got through the whole thing and on the way in the car I sing about it (but I also don’t try to overdo it). The minute she gets in the chair or the doctor comes in she is hysterical. I can’t understand this. I was rather disappointed when her doctor was annoyed by her 3 year checkup – says he wouldn’t expect that kind of a temper tantrum from 3 year old. I would not have called it a temper tantrum and I tried to support her lovingly. I’m still searching for how to help her with these interactions with people (other interactions such as adults at the park or babysitters are fine). Hmmm…that’s interesting! My first thought is that without meaning to, you might be overdoing it a bit. Our children are extremely sensitive, not only to what we say and do, but also (and maybe even more so) to our “subtext”. Your daughter may be picking up the fact that you do not expect her to enjoy these situations, so you are talking and singing to get her excited about them. It sounds like you might be trying too hard to make everything sound fun, rather than just calmly explaining what will happen in a new situation, the way you would to another adult. I could see this creating a little bit of fear… she wants to join in your enthusiasm, but then she’s thinking, “Why is my mom trying so hard to make this sound good? It must be something really unpleasant. ” If you are feeling at all apprehensive, or nervous about the situation, that can be worrisome to your daughter, too. Jill, please keep in mind that I could be way off on this! It always helps me to check myself, “Would I speak this way to another adult?” I have also learned that our children are so much smarter and more perceptive than we imagine them to be! Thanks for sharing your situation and please keep me posted! Oh Janet!How nicely you have nailed the problem. I was exactly in the same boat sometime ago, repeating to my son the events would occur at the docs office/hair cut and wondering why it wsnt working for us. We modified our approach this time around and told him the day before that we were going fir doc visit and then the next morning we calmly told him the process their. Wow! The visit went like a breeze and the nurse who gave him the flu shot was all praises for him. Thanks again for all that you do towards educating us parents. Great news! Thanks so much for your encouragement, Savitha. I have always done the same with my kids. When I took my son for his flu shot and final vaccinations, I didn’t make a big deal of it, but before he actually got to the shot I explained what would happen and that it would pinch a little but he would feel better soon after. At the flu clinic he was the only kid who didn’t howl when he got the shot, and when he got his final vaccinations, although he teared up a bit (there was more than one shot after all), he was cooperative and fine. I feel like it’s an important trust-building step for kids. The last time he had to go to the doctor he cried because he didn’t want to go, but instead of distracting him or promising a treat, I talked to him about what was going to happen and discovered the upset was because he was worried he had to have more shots. Once he learned that was actually going to happen, he calmed down and was fine. My doctor is also from the school of distraction, but I just step in and narrate what’s happening so that my kids know what to expect. Briana, thank for your wonderful illustration of the power of preparation and honesty. Yes, it certainly is trust-building! Physicians are so clueless…;) Well, many are. You did some good teaching on that day, Janet. Thank you, Barbara. I don’t seem to have had any affect on that doctor’s way with children over the years, but he’s such an excellent physician that I keep coming back. I’ve actually met some very respectful physicians also, and they really stand out. There’s one in particular at our local urgent care. And our dentist has a wonderful rapport with children, never, ever talks down to them. I remember being at the pediatrician for a regular check up and a mother told her 2 or 3 year old toddler “Look that boy didn’t cry so you won’t have to either!” and my husband and I were looking at each other realising that this was not the awkward situation we would want to put our son in. Why not cry when it hurts ? It’s much better to take when you know it’s going to happen though so this is what I keep telling my son also before we leave the house. We have had several experiences with the docs and most of the times I had to play the moderator myself while the docs or nurses were busy doing their thing AND placing mobiles or funny toys above our son’s head. They think the kids are not capable of understanding but instead they are just making big fools out of themselves. I know that for my own son, who is not quite three yet, I have found that it is so far best to tell him about things like doctor’s visits a little bit in advance, but not days in advance, if that makes sense. I migth tell him in the morning that we’re going to the doctor’s office. On the way there I might talk about what would happen there, and then conclude with the fact that the shot would pinch for a moment. We just did the flu shot, and I found it was also helpful that my husband and I had ours first, so my son could watch and see that we were ok. He was upset for a moment when the shot went in, but calmed down really quickly and recovered fast. Janet reading your piece I was reminded of time my son, now 14, was 6 and needed stitches. I have always used real words to explain what is going on and my kids have always found it comforting. When the doctor started doing Tom’ stiches he called the shot, a pinch of “Silly Juice,” Tom said to the Doctor, “you mean a shot of Novacaine.” The doctor gave me the funniest look, but I thought it was great! Thanks for a great piece! Oh, I love that, Kathy! Thanks for sharing! This just happened to us yesterday with our 2-year-old son. He had a challenging procedure done and there were quite a few people in the room. They would only allow ONE parent in the room (ridiculous rule)… They also had a ton of toys with bells and lights to “distract” him and weren’t planning on telling him a thing. I told them he does understand everything, and just needs to know what is going to happen in ways he can comprehend… in simple terms. I still had to keep asking them what was happening since I couldn’t see much (machines)… to tell him what was going on. It was frustrating for both of us. I do think he did much, much better because I was able to explain things to him. Even though the people doing the test obviously liked my son and wanted him to do well during the test, and they worked hard to talk to him and show him fun toys, I was disappointed that they didn’t seem to understand that he could indeed participate and comprehend what was actually occurring. I hope that they learned something from how we did things and maybe will start to do things differently in the future. We have also found over the years with our kids that telling very young children too far in advance can produce way too much anxiety. The older the child, the more in advance you can talk to them about what’s going to happen. My daughter’s first visit to the dentist was much the same. The dental assistant coached me on how to pin her arms down (I just gently held her hands to satisfy her), and then proceeded to natter on about stickers and rewards. Meanwhile, my poor daughter was genuinely interested in what the dentist was doing and I had to tell the assistant to back off because she was just confusing matters. Oh, and on top of that, my daughter was simply handed the pink toothbrush out of a bucket that had at least 4 different colours in it, she was not given a choice. That visit was 7 months ago, and my two-year-old still talks about it with fascination and wonder!